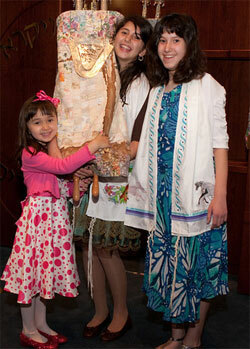 Each Bar/Bat Mitzvah at TBS is as unique and special as the child coming to Torah. All of our students have studied Jewish studies and Hebrew for at least four years prior to becoming a Bar/Bat Mitzvah, and our Hebrew program culminates with Rabbi Perlin’s Bar and Bat Mitzvah class experience where Jewish values meet Hebrew learning in an interactive and self-esteem building curriculum. Prior to entering this class, each family attends a 4-5 week workshop to prepare for this life cycle with parental involvement. Each student, along with his/her parents chooses the service and all the music for our Saturday morning worship, and in addition to reading from the Torah, our students also lead the service, and write a personal prayer which they share with the congregation. And our parents have the opportunity to pass the Torah to and offer prayers on behalf of their children. In the end the whole service is unique for each family and focused on this one Jewish child becoming a spiritual Jewish adult. Bar/Bat Mitzvah is not the end of learning for our students. The experience is so wonderful for each child that TBS boasts a 95% return to 8-12th grade.